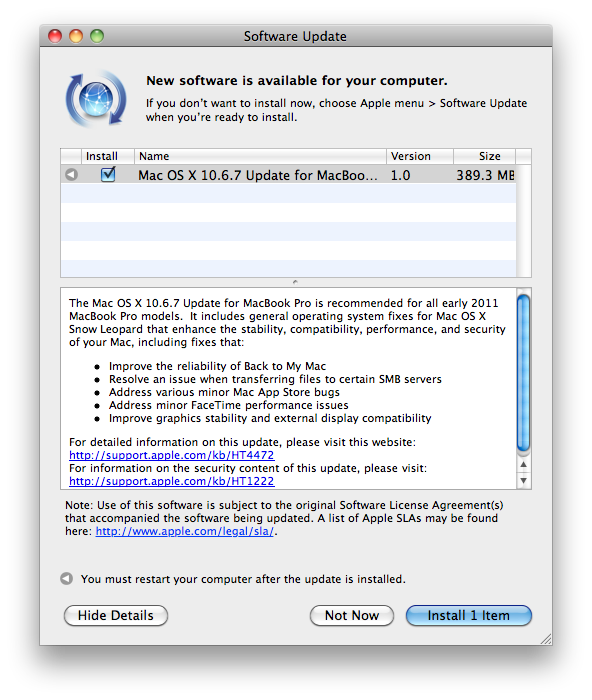 The seventh free update to Mac OS X 10.6 Snow Leopard is now available through Software Update, offering a variety of bug fixes and security enhancements. Apple notes that the new 10.6.7 release includes "general operating system fixes that enhance the stability, compatibility, and security of your Mac," including adjustments that improve the reliability of Back to My Mac, resolves issues when transferring files to SMB Windows Files Sharing servers, and addresses Mac App Store bugs. A special build for the new early 2011 Thunderbolt MacBook Pros, which shipped with "Mac OS X 10.6.6" but using a special build supporting their unique hardware, also "addresses minor FaceTime performance issues" and is reported to "improve graphics stability and external display compatibility." Following the release of the new models, some users complained of external display flickering, temporary blanking, and occasionally a full system crash that appeared to be related to using external displays through the Mini DisplayPort-compatitible Thunderbolt port. After applying the two separate updates, Macs prior to the Thunderbolt MacBook Pros report having build 10J869, while the new notebooks report build 10J3250. 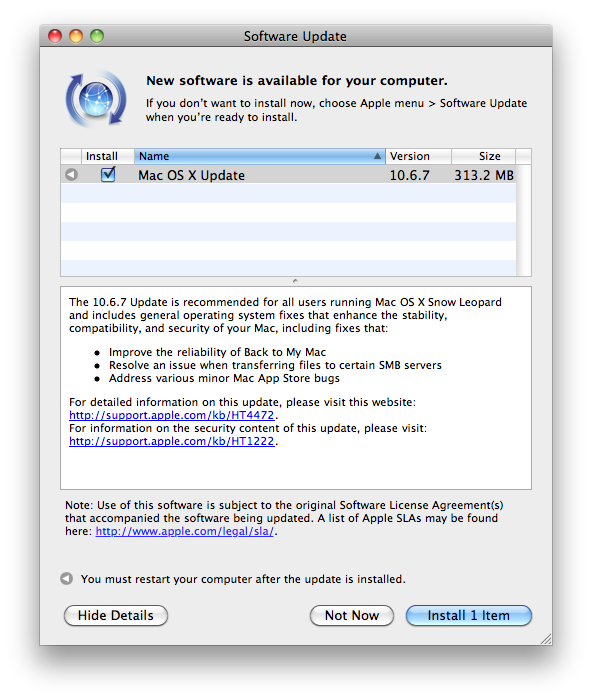 Security enhancements included in Mac OS X 10.6.7 are also available for Mac OS X Leopard 10.5.8 systems through a parallel Security Update 2011-001 through Software Update. Among the security patches included in the release are updates for AirPort WiFi networking, vulnerabilities in the Apache web server, fixes pertaining to AppleScript, three patches the improve Apple Type Server, improvements to bzip2 file compression, the CarbonCore API, CoreText, virus scanning in ClamAV used by Mac OS X Server, and a new definition for OSX.OpinionSpy malware that will enable automatic file quarantine. Apple has also patched security flaws in HFS and in ImageIO and Image RAW file handling. Other security enhancements target the Installer, Kerberos cryptographic issues, kernel security, Libinfo, libxml, Mailman, PHP, Microsoft Office QuickLook issues, and five issues related to QuickTime. The update also rolls in patches for Ruby, Samba, Subversion, Terminal and X11.